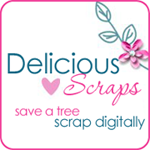 Delicious Scraps: Free CU Mini Scrap Kit "Sweet Valentine"
Free CU Mini Scrap Kit "Sweet Valentine"
Thank you for the three parts to this Sweet Valentine kit. It really lives up to its name by being really sweet and the pink, how nice for a change from the usual red. Thank you... I love it! LOVE this kit! Thanks soo much! Thank you so much for this post. I want to let you know that I posted a link to your blog in CBH Digital Scrapbooking Freebies, under the Page 2 post on Feb. 11, 2011. Thanks again. Thanks for the sweet element. Happy Valentines Day to you and all you hold dear! Thanks for the sweet element! Happy Valentines Day to you and all you hold dear!